More info:Plus local payment from USD 990. Travelling overland brings you up close to a country and its culture and it’s one of the best ways to experience South America. This trip spends just over three weeks travelling overland by truck through beautiful and exciting Patagonia, beginning in Santiago in Chile, snaking south and ending in remote Ushuaia in Argentina, the world’s southernmost town. Patagonia is the perfect destination for anyone who loves the outdoors, and this 23-day adventure includes lots of camping in National Parks with the chance to hike, cycle, climb and ride horses through breathtaking scenery. The journey begins in the elegant capital of Chile, Santiago, beautifully tucked in amongst the mountains. From here, visit the spectacular Lake District towns of Bariloche and Pucón, which are a paradise for adventurers, with lots of optional outdoor activities available. Then journey south on the stunning Carretera Austral to desolate and wild Patagonia, a legendary place that is home to some of the most amazing views on the planet. We will explore the magnificent Los Glaciares National Park in Argentinian Patagonia, from both El Calafate and El Chaltén, so that we can trek around the peaks of Mount Fitz Roy and take a guided trip to the enormous Perito Moreno Glacier. In Chile, one of the trip’s undeniable highlights awaits – the awe-inspiring Torres del Paine National Park. You have four days here to explore and hike around the beautiful landscapes of mountains, glaciers and icebergs. 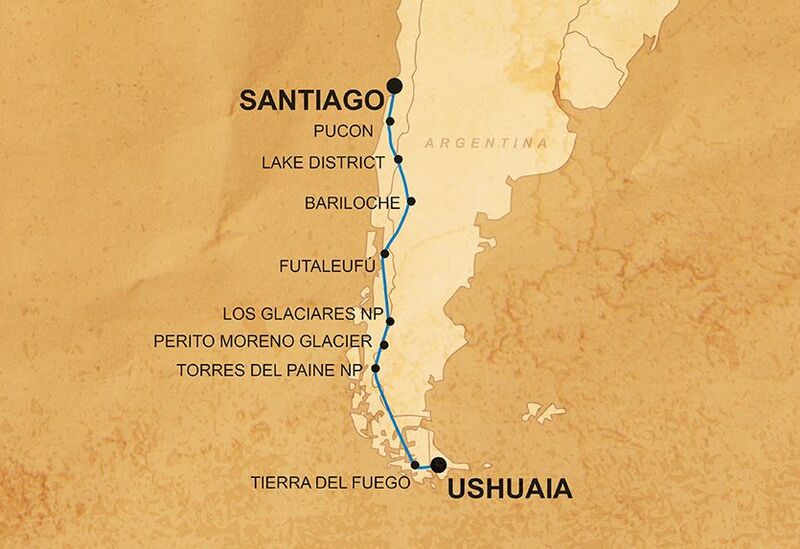 Finally, we will cross the Strait of Magellan and travel through this huge, wild region to the end of the earth, Tierra del Fuego, and to the town of Ushuaia, perched on its southernmost tip. All in all an unforgettable overlanding experience! On this epic trip through Chilean and Argentinian Patagonia, we will be travelling overland using a combination of overland vehicles, boats, and buses, thus cutting out the need for air travel and reducing carbon-emissions. Going overland (by car and on foot for excursions) means you get to experience physically crossing the borders between countries as well as explore places which are off the beaten track. We use local guides and operators throughout the trip; for example, in Torres del Paine National Park we use a responsible local operator that provides training and employment to many local people as guides, providing them with stable employment in the tourism industry.